One of my most favorite tours at Playa Nicuesa Rainforest Lodge in Costa Rica is to go kayaking in the mangrove estuary at the Esquinas River, and then snorkeling in Golfo Dulce. There is a magic in peacefully gliding along in a kayak; the only sounds coming from small splashes of kayak paddles sliding through the water, the songs of birds, and the occasional explosion of noise from rainforest insects. Tangled mangrove roots stretch down into silty water like tentacles, while multicolored crabs skitter along the dank wood. Sunshine lights up lime green water reflecting dense green vegetation. If you stay alert, you may spot the bumpy snout and eyes of a partly-submerged caiman or crocodile. Or you may see a rainbow boa curled around a tree branch, or catch sight of white-faced, spider or squirrel monkeys swinging through the trees. Birds are plentiful, so you will surely see snowy white egrets, ibis, toucans, Scarlet Macaws, any number of kingfishers and herons, multitudes of shore birds at low tide, and maybe a low tree splashed pink with Roseate Spoonbills. From Playa Nicuesa Rainforest Lodge, you travel by boat along the coast further up into the Golfo Dulce (Sweet Gulf) to get to the Esquinas River (meaning â€œcornerâ€ river in Spanish). Kayaks will be towed behind the boat until you reach the river. The Esquinas River is a tidal river, meaning the water level is fuller at high tide and lower as the tide pulls the river out into the Gulf. You will always kayak with the current to make paddling easier, so depending on the tides depends on whether you start kayaking upstream or downstream. 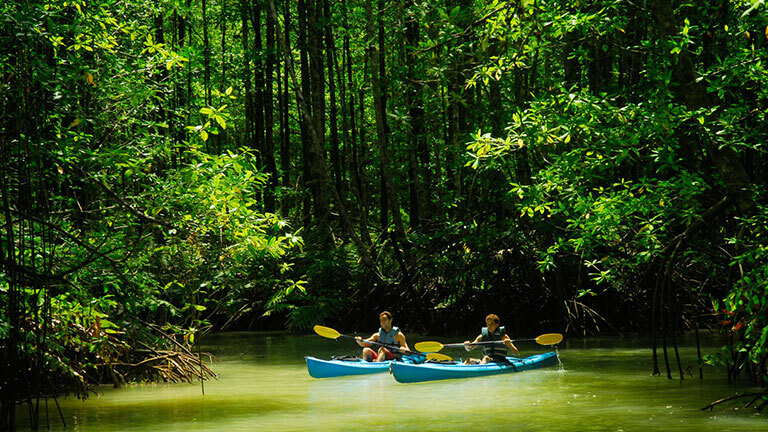 Besides kayaking in the main river, you will explore small tributaries amid the mangroves. After an hour or more of kayaking, you will board the boat once again to travel back out into the Gulf to a prime snorkeling spot. Right off the coast, there are many small coral reefs housing masses of brightly colored tropical fish and other marine life. The Gulf water is warm, calm and usually crystal clear. On the way back to Playa Nicuesa, watch for playful dolphins, sting rays and sea turtles in the water. In September, you might see migrating Humpback Whales that come into the Golfo Dulce to breed and give birth. Playa Nicuesa Rainforest Lodge is an environmentally sustainable Costa Rica eco-lodge by the Osa Peninsula. The award-winning eco-lodge offers family vacations, honeymoon trips, nature and adventure vacations, and yoga classes and retreats.